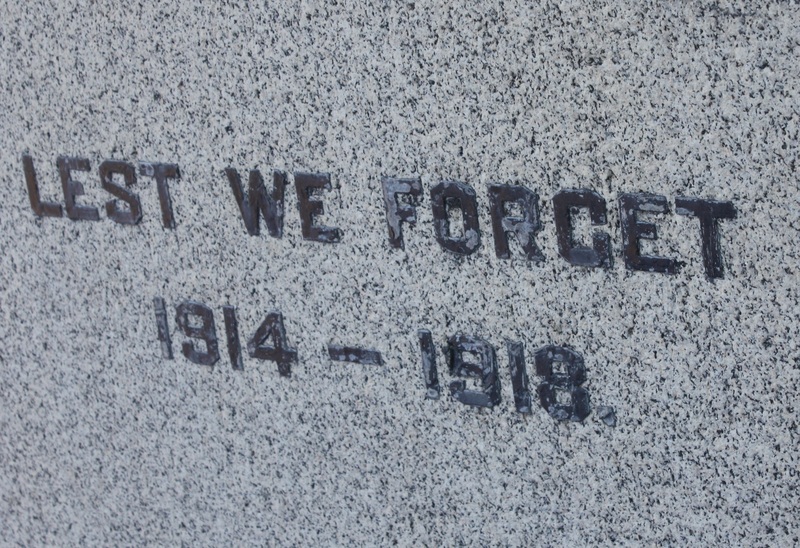 Inscription on the Camrose War Memorial (image courtesy of Janine Carroll, Camrose Genealogical Society). Sgt. Harry Connor (killed in action)-Colour Sgt. Princess Patricia’s Canadian Light Infantry. Sidney Rowsell-enlisted with 51st battalion, transferred to 49th Highlanders. Pte. Harold Rowsell (killed in action)-51st Battalion, then transferred to 15th Battalion. Pte. Brookfield (killed in action)-enlisted with 51st battalion, later transferred to 63rd battalion. Theo. G. Young (killed in action)-formerly the Camrose Jeweler. Capt. Vernon Lamb- a field surgeon. Pte. Jack Thompson (a.k.a. “Dugout Jack”)- formerly with 151st battalion, from Strome, Alberta. Pte. W. A. Sims-from Avonroy. Pte. Bemister-enlisted with 196th battalion, transferred to 46th battalion, former employee at the Merchants Bank of Camrose. Sgt. “Tommie” Nelson (killed in action)-202nd battalion. Pte. Walter Schiedegger-previously with 151st battalion, transferred to 50th battalion, from Heather Brae district. Pte. Jack S. Tarbolton-Royal Flying Corps. Pte. J. W. Stamp-enlisted with 196th Western Universities battalion, drafted with 46th battalion, former employee of the Merchants Bank of Camrose. Lieut. H. G. Vickery (killed in action)-formerly in tailoring business and held a seat on Camrose Town Council, then moved to Strome, Alberta. Lieut. Stewart McCulloch-151st battalion, Vimy Ridge hero, from Strome, Alberta. Pte. Jim Henderson-a machine gunner enlisted with 89th battalion, transferred to 10th battalion, former employee at the Harris Dairy Products Co. in Camrose. Pte. Tom Henderson-infantry, enlisted with 89th battalion, transferred to 10th battalion. Pte. William Gilchrist (killed in action)-formerly employee with the Harris Creamery, 89th battalion. Pte. Geo. Hoover-a Lewis Machine gunner with the 5th Universities (reinforcements for Princess Pats). Pte. Leroy Churchill-151st battalion, acting corporal, former teacher at Bittern Lake School. Ward-15th battalion, former ledger keeper at Merchants Bank. William Altvater-enlisted with 78th Artillery Battery of Lethbridge, from Bittern Lake. A. H. Grant-enlisted with the CNR Company (3rd Canadian Division). Pte. Harold Michael Kennedy (killed in action)-51st battalion, attended Camrose High School, former employee of the C.P.R. Company. Pte. Jack Kennedy-196th Camp Hughes.